Karenlovesraw: Treats for the Girls.. and boys..
Strawberries are in abundance at the moment and they smell devine! So in a burst of energetic enthusiasm I threw a heap of ingredients into my new blixer to see how it would go.. in no time at all I had a delicious batch of chocolate fudge. 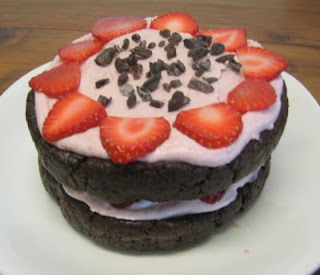 Here is the result of on the spot choc fudge and fresh strawberries..